Do you believe there is such a thing as too much of a good thing? When it comes to certain roses I believe there is no such thing as too many. 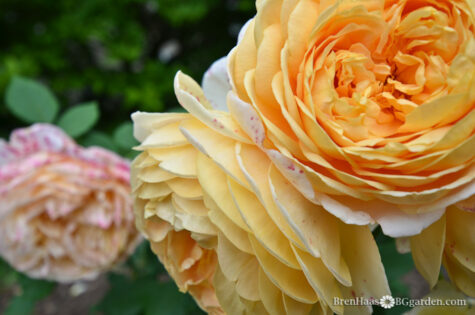 Today I’m encouraging my readers to stop and smell the roses in pairs. When you are shopping for roses pay close attention to how big the variety is expected to grow and try and imagine the space you want to plant. Will this treasured variety get lost in your landscape without growing with a partner? Look at the big picture and image the blooms if they are dancing in the garden space in a mass planting. In my garden last summer there were many roses that grew together that made an impact. I can’t image a few of these spectacular species growing alone surrounded by different plants. One of my favorites to grow together is the David Austin Yellow Crocus. This variety is labeled to grow only 3 feet tall and I fear it would get lost growing by itself. Planted in groupings of 3 or more is the key with this variety. I planted six crocus rose shrubs in a 15 foot landscape border. The pink and yellow varieties are alternated in this planting. Each color take turns blooming in the row making this a fabulous show garden along the driveway entrance to my Ohio home. My first pairing in the front rose garden was these Distant Drum roses by Weeks Roses. I don’t know why I bought two … maybe because they were the only ones left at the garden center that summer trip? This planting really made me aware of what an impact planting in pairs can do in the landscape. Another double planting is back in the landscape that surrounds my greenhouse. In front of the trellis where 2 different varieties of heirloom climbers grow I planted two red landscape roses. I’m not sure what variety they are but I do know they are from Proven Winners and they have been making a statement together in my garden for 3 years now. The photo above is early spring just as the tulips are beginning to bloom. 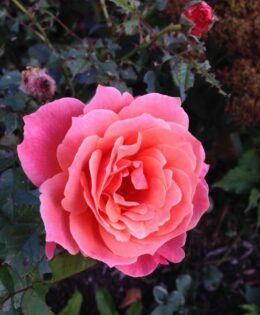 This is a collection of beautiful pictures of roses I want to recommend for your home garden. Be sure to pick up at least 2 next time you are at the garden centers. Lorette Lynn Rose, Sedum , Mums and Hibiscus … all on a late September Day! I hope I didn’t over whelm you all with images today. I just can’t stop sharing when it comes to roses due to the success with little maintenance I’ve had with these variates. Please tell me what you think by leaving a comment on this post. I’d love to hear what roses you pair up in your garden. Awesome post Bren. You are growing some beautiful roses….. THank you Chris … honored to have you stop by and share today! These are beautiful. Have you tried cutting any of these varieties? Do they hold up well in vases? You are tempting me to dig up more of my lawn and put in more roses. Oh my gosh, you can never have too many images in a post! Loved looking at all your beauties. thank you … can’t wait to check out your site too! 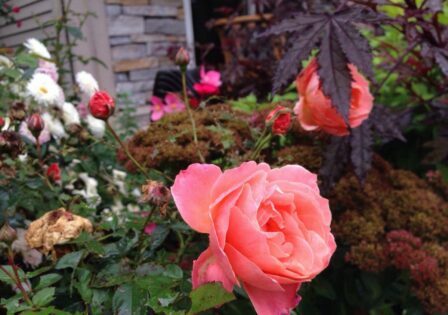 Love, love, love all the beautiful rose images Bren! I have a policy of always buying more than one unless I am buying a plant purely to propagate (or if it is the last one!). I like symmetry in my flowering plants and I like to have a back up with my vegetables. Yesterday I bought a rather unhappy looking carpet rose – it seems to have lost half its branches and has no flowers (it will be a surprise to see what the blooms look like if it recovers!). I only have the one as a result, but once it has some new growth, I might try propagating it to ensure my 2 minimum. If mine looks anywhere near as healthy as yours, I will be very pleased!